Productivity in the US has been steadily increasing for the last few decades, and that is certainly great news; however, in this market of near “full employment”, hiring and retaining good talent is increasingly difficult and that can affect our productivity negatively, as we are forced to overwork our team, and hire people that we wouldn’t regularly hire. 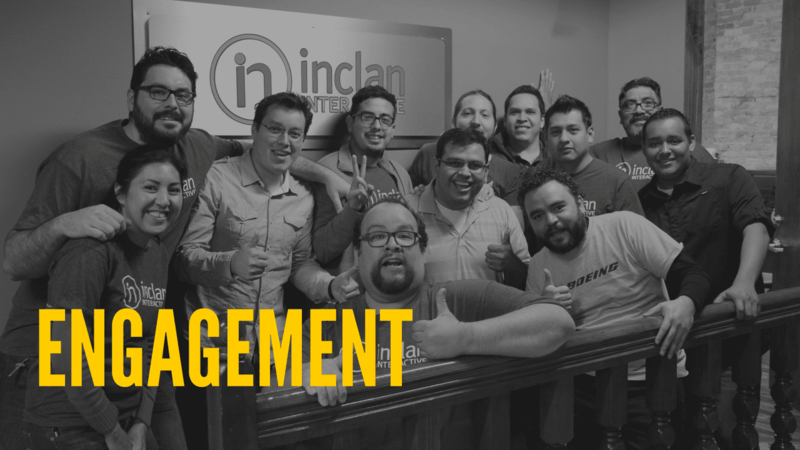 We established Inclan Interactive back in 2009 as a software development and consulting firm based out of Provo, and being a small company (there is 15 of us) we need all hands on deck more often that not. Everybody in our company plays a key role, and a lot of responsibility is delegated to each individual. It is crucial that they understand the magnitude of this responsibility, take ownership of their tasks, and are constantly willing to think outside of the box and come up with creative solutions. The challenge for Hugo and me as co-founders, has been on how to keep up the level of engagement needed for us to be successful and continue growing. Luckily, back in 2010 and while at the MBA program at the University of Utah (feel free to add BYU – Utah banter in the comments), I had the extraordinary opportunity to sit in a class that changed the way I look at management forever. In this management class, professor Sandra Spataro, shared with us different insights of successful and less successful management styles and study cases. Then she shared with us a document put out by Gallup Consulting called Employment Engagement: What’s Your Engagement Ratio? which drills down on using “Employee Engagement as a Core Strategy”. The whole 12 page document is full of eye opening information, but page four has what Hugo and I have been trying to follow these last nine years. It shares results from 30 years worth of research involving over 17 million employees across many different industries. According to Gallup, these results help predict work performance and engagement, or in plain and simple English: what makes an employee tick. “I know what is expected of me at work. The first thing that came to my mind after reading these 12 points was: “How about the PlayStation in the break room, the soda machine, and the bonuses”. Sure, those are nice and people like them, unfortunately they are not one of the main drivers of engagement. As co-founders, and because of the size of our company, we have the fortune of having one on one interactions with our staff members regularly. We’ve tried to implement these 12 points in one way or another to our management style, and we have seen tremendous results. Rather than spending money in break room paraphernalia, we invest those dollars in experiences we can provide our team, like yearly retreats where we all get together and do all kinds of fun activities, discuss one on one their dreams and aspirations, and try to plot with them a path forward to accomplish them. We follow up throughout the year checking in to see we are still on the right track, and the next year when we get together we evaluate how we did, how we can improve, and set new goals. This is a very small example that has worked for us, and I’m sure that given the size of your business and other factors, things like the one I described may not be feasible if you try to implement it the same way; however if we train our team leaders and managers to look for these opportunities they can be implemented in smaller groups without leaving the office but making it fun and truly showing that we care for our team. Thanks for reading this, and feel free to leave any comments at the bottom of the page (BYU – Utah banter included). If you’d like me to email you the 12 page Gallup study, feel free to email me and I’ll forward you the copy.